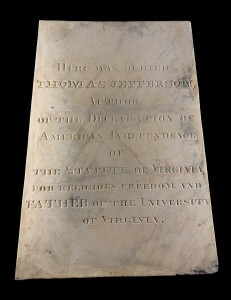 Thomas Jefferson’s tombstone has led an interesting life. 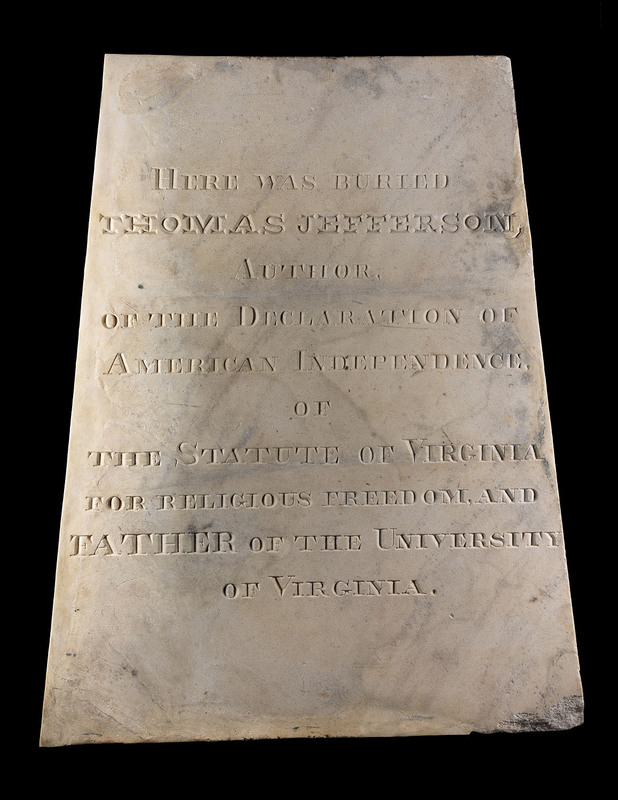 In 1833, 7 years after his death, the tombstone was made to his exact specifications and placed in the graveyard of his home, Monticello. The years, the weather, and even vandals took a toll on the tombstone. Within 50 years, it was in terrible condition. 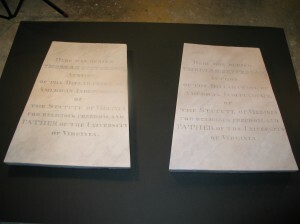 A copy of the grave marker was made for Monticello and Jefferson’s family gave the original to the University of Missouri. Unfortunately, in 1892 a fire severely damaged the tombstone. Sadly, it was not repaired very well at the time. In 2014, however, the tombstone’s luck began to turnaround. 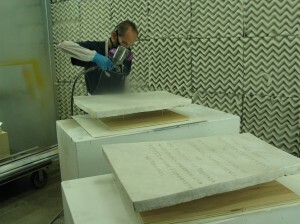 The Smithsonian Museum Conservation Institute (MCI), in Suitland, MD was able to treat the tombstone. While it was at MCI, OEC paid the marker a visit and photographed it – many, many times – in order to make 3D replicas. 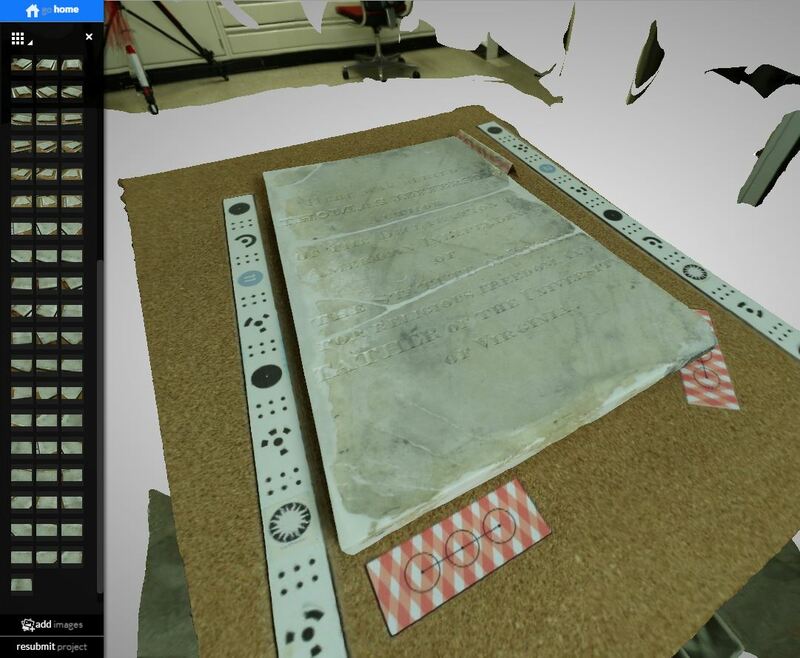 Carolyn Thome went MCI to digitally capture the tombstone using photogrammetry. Carolyn took over 200 photographs of the tombstone. The photos were uploaded to the “cloud” for photogrammetry software processing. Chris Hollshwander used computer aided machining (CAM) software to create tool paths to drive a computer numerical control (CNC) router. He used these tools to cut a master pattern in polyurethane model board. Once the pattern was created, a silicone mold was made to cast the replicas. Each replica was made of a material suited to its intended use. The replica displayed outdoors on the original granite obelisk was cast in glass fiber reinforced concrete (GFRC), a material that has a stone-like texture. The other replica is used for educational presentations. To keep it lighter and easier to handle, it was cast hollow in glass fiber reinforced polyurethane resin. At this point, it was Erin Mahoney’s turn to tend to the replicas. She used a combination of faux stone and faux marble techniques to paint them, matching the color variations of the original Vermont marble. 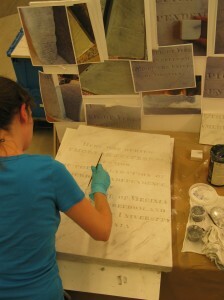 Erin paints one of the replica tombstones. Finally, Chris Hollshwander applied a UV protectant polyurethane clear coat. Chris sprayed a protective coating on the replicas before they were shipped to the University of Missouri. 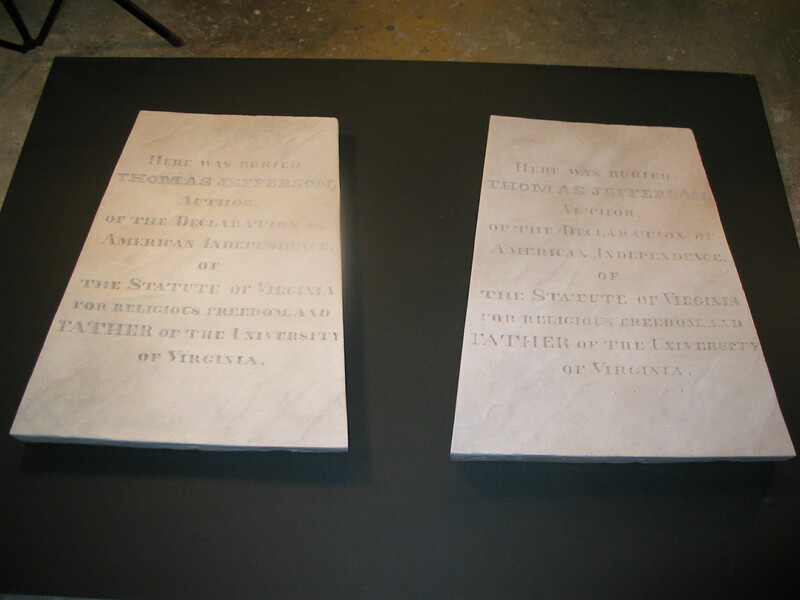 … and the two replica tombstones. Could you tell the difference? It’s a bird! It’s a plane! It’s OEC’s first comic book!